Listed below are a number of web databases and resources to help you plan and perform your experiments. These include antibody resources, proteomic tools, disease and mutation databases, as well as several web sites that provide useful tools for signal transduction related research. Scansite predicts phosphorylation sites and specific domain-binding regions within proteins, MIT. Neural network predictions of phosphorylation sites in eukaryotic proteins, Technical University of Denmark. Analyses of protein kinases from human, yeast, worm and fly. Signal transduction knowledge environment: resources and information on signal transduction, Science Magazine and Stanford University. Requires Subscription. Biomolecular Interaction Network Database serves full descriptions of interactions of proteins, nucleic acids and small molecules. "Open source" resource providing online maps depicting selected signaling pathways. Identification of yeast genes whose mRNA levels are regulated by the cell cycle, Stanford. Cytokines & Cells Encyclopedia, University of Munich. Information system for G protein-coupled receptors. Predictions of GalNAc O-glycosylation sites in mammalian proteins, Technical University of Denmark. Collaborative effort to build integrated, multidisciplinary models of neurons and neural systems, Yale University. Extensive annotations of ‘hot molecules’ that may play crucial roles in common diseases, Weizmann Institute. Excellent compendium of tools and resources for molecular biology and proteomics, University of California San Diego. 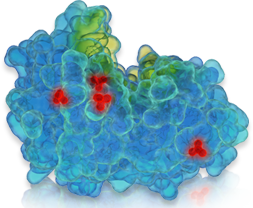 Informational resources for cellular and molecular biology. Links to resources for expressed sequence tags analysis, University of Brescia. NLM’s search service to citations in MEDLINE, with links to online journals and other related databases, N.I.H. Free “alerting” service that scans daily updates to the NCBI, Medline and GenBank databases. Effort to make the world's scientific and medical literature freely accessible to scientists and to the public around the world. Database of disease-causing mutations in tyrosine kinase domains, links to other mutation databases, University of Tampere. Atlas of Genetics and Cytogenetics in Oncology and Haematology, dedicated to biological and molecular aspects of cancer and cancer-prone diseases. Online Mendelian Inheritance in Man: catalog of human genes and genetic disorders, N.I.H. Human Gene Mutation Database, Institute of Medical Genetics, Cardiff. Links to a number of locus specific mutation databases, N.I.H. Positionally cloned human disease genes, N.I.H. Cancer Genome Anatomy Project: database of the genes responsible for cancer, N.I.H. Source of mouse strains with transgenes, or with targeted or chemically-induced mutations, The Jackson Laboratory. Human mitochondrial genome, Emory University. The mouse genome, Jackson Laboratory. C. elegans genome, Sanger Center.